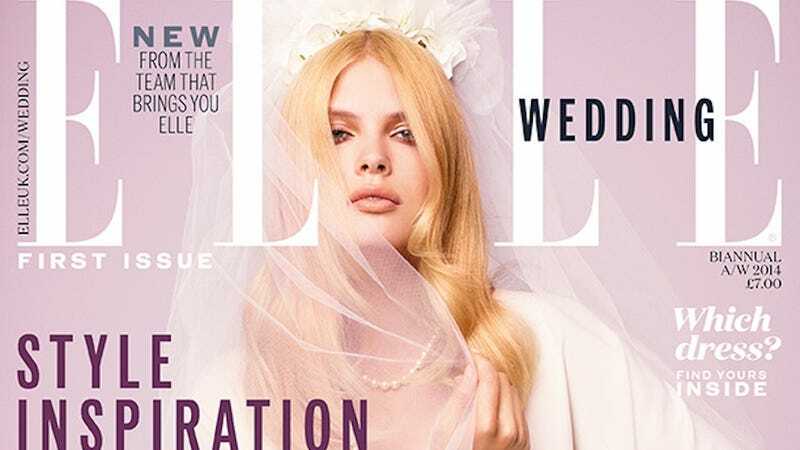 Soon there'll be yet another wedding mag jostling for the attention of harried brides-to-be: Hearst UK is launching Elle Weddings, because $$$$$$$. WWD reports that the Elle UK team will pitch in to produce the mag, which sounds like it'll be the Cressida Bonas to Town and Country Weddings' Kate Middleton. The title will, according to Hearst, "help the bride showcase her own style," and the tagline will be "individuality not conformity." The first cover features "a fashion-forward bridal look by Chloé." In other words, we have reached Peak Alt Bride, with a pinch of the Stupidly Expensive Rural Outdoor Wedding. It's always fascinating to see a new magazine hit newsstands when so many print outlets are, at this point, the walking dead. But it's obvious why: Elle Weddings will launch with advertisers like Cartier and Jenny Packham, and everyone knows that most brides will buy practically anything and at a 50 percent markup, too.